Protection, it's in our nature! practices throughout our offices and warehouses. business that make financial sense too. Throughout the Rajapack packaging range, we offer an environmentally-friendly choice of ecological alternatives and protective packaging. 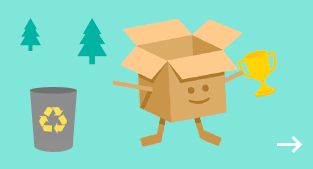 You can find packaging supplies which are either made entirely of recyclable materials or in part, and products that are 100% biodegradable. Also, packaging made from certain materials and manufactured to a standard recognised by environmental certifications. Rajapack's environmentally-responsible buying policy encourages practices to source suppliers to purchase and buy locally.